Greetings, dear readers! I hope you have been having a wonderful week and this post finds you well! 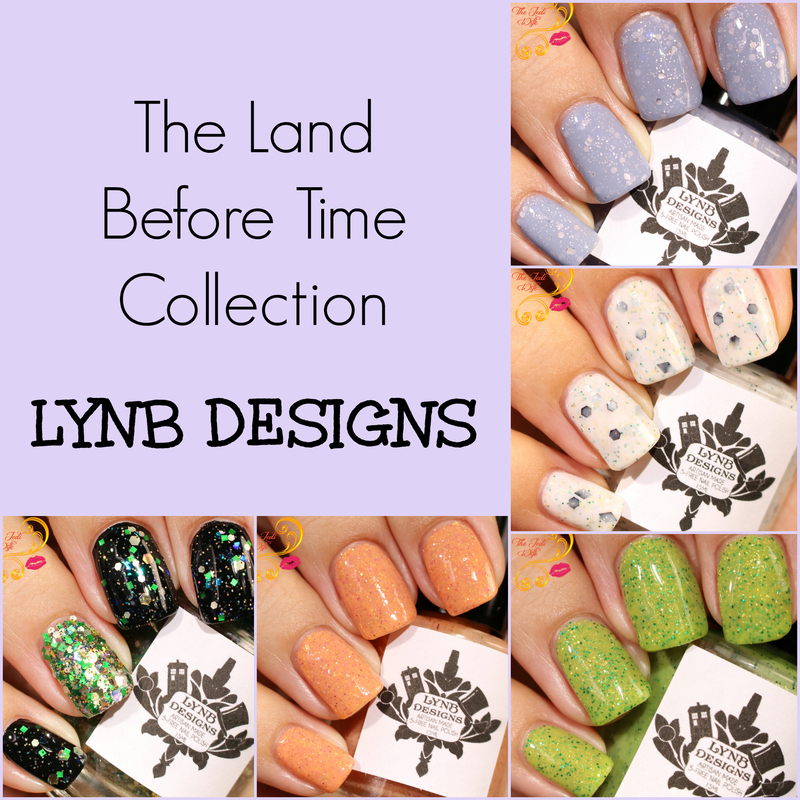 For today's post, I have the reformulated LynB Designs The Land Before Time Collection to share with you! As you have already seen with my 5th blogiversary celebration earlier this year, I've been following the indie polish community for quite some time now. I actually remember when the original Land Before Time Collection was released about four years ago, and I am really excited to see this collection making a comeback! The colours and feel of the collection are very similar to the original shades, but there are subtle differences due to the reformulation. Seeing these new versions has shown how LynB Designs has grown, and these shades feel more "complete" than they did previously. Let's check them out! Littlefoot is certainly one of the stars in this collection! I adore muted purple shades, and this purple-kissed grey crelly is simply perfection. The glitters lay nicely against the background, and I really like the subtle pops of pale light purple from the iridescent glitters catching the light. This applied really nicely for me without any troubles although you do need to take care in layering so you can have the iridescent glitters showing. They can get a little lost against the background so thinner coats are the best way to showcase all the aspects of the polish. I'm sure it comes as no surprise to anyone to discover that Cera is my personal favorite from the collection. This light orange polish is fabulous, and I adore the touches of pink dancing among all the orange! The formula is sublime as this polish just about applies itself! This is such a fun and bright, but not TOO bright, shade of green, especially for the spring! Green and gold are a match made in heaven, and Ducky showcases these colours perfectly! This is the most sheer polish from this collection, and I did find that I needed a third coat for opacity. That's not a deal breaker for me, especially since the formula is on point, but you can easily layer it over a similar shade if you prefer to use fewer coats. As for myself, I love the depth from three coats so I'd recommend sticking with just this on its own. Petrie was one of my favorite characters from the movie, and this is such a fun interpretation of the character. This polish applied nicely for me, and I was a little surprised I only needed two coats for opacity. It applied easily enough for me although you do need to take care with the bar glitters to keep them from hanging over the nail. I am admittedly not a fan of bar glitters, although they are thankfully far and few in between with this polish. Should you not be a fan of bar glitters either, they can easily be removed during application. Glitters don't get as much love as they used to, and it's such a shame since they are so much fun! I'm happy to see a glitter topper/glitter bomb in this collection. The glitter assortment in Spike is beautiful! I can't quite decide if I prefer it as a topper or sponged on as a glitter bomb; it looks fantastic either way! This applied nicely for me with no digging necessary and no glitter clumping: the glitters spread out so perfectly over my nails! The Land Before Time Collection launches April 7th at 7pm EST on the LynB Designs store located here. Each polish retails for $10 a piece, and if you pick up the full collection, the cost is $50 and free shipping within the US. 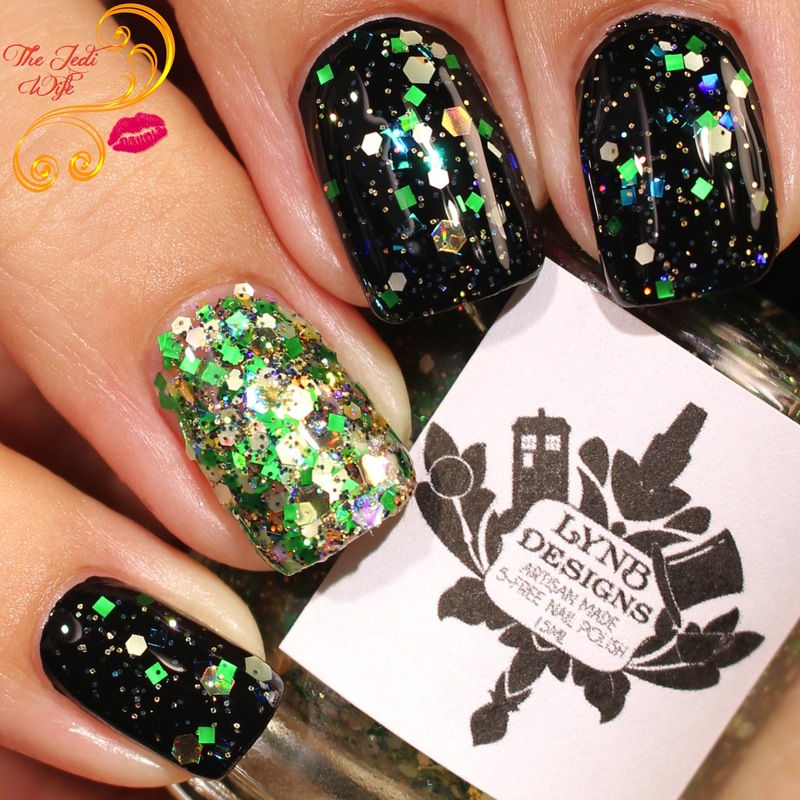 In true LynB Designs fashion, this collection will be launching with a coupon code! Use the code LITTLE and save 50% off any purchase in the store for a limited time! Do you have a favorite shade from the collection? Do you have any of the original polishes from when it was first released? I'd love to hear from you! littlefoot is pretty! it reminds me of revlon popular but in blue! Ducky is so cute and Spike is gorgeous! you had me at Littlefoot. Aw The Land Before Time! Love the theme! Oh my gosh, I need to watch that movie again! Ducky is my favorite! I'm in such an orange mood. Love Cera! Awwww I love this movie. Totally makes me cry. Interesting collection, it's a total throw back to 2012 with those finishes. I love Spike. Green and my skintone usually hate each other, so glitter is one good way of wearing the shade. Love these colors, they are so unique! I think the first three are my favorite. I can't pick a favorite - they're all so fun! I am a sucker for crellies so there is no way I could pick a favorite! Gorgeous swatches! This takes me back -- I loved that movie/series! All the colors are really, really pretty!